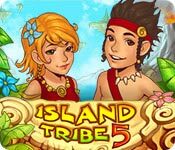 New exciting adventures of islanders are waiting for you in your favorite game - Island Tribe 5! Do you want to rescue our old friend вЂ“ scientist? Risking his life he decides to plunge into the deeps in search of Atlantis. He finds what he was looking forвЂ¦ But the price is too great for this discovery - he is being held hostage by the cunning Atlanteans who take him away to their mystic country. His fate is in your hands! You will have to cope with sly golems, dreadful beasts and hidden portals! More adventures are coming!